Mt. Etna Broom is a remarkable TREE from the slopes of Italy’s tallest active volcano. 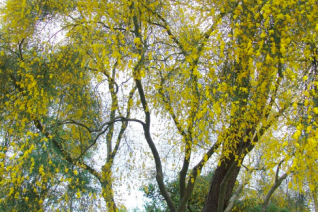 Unlike Scotch Broom (Cytisus scoparius) this fine, leafless tree will NEVER become a pest in our climate. Rush like pendulous green stems are replete with yellow jasmine scented pea flowers for months in summer. This tree casts no shade but provides an elegant vertical element. The sweet perfume travels many feet on a warm day. Blooms May-August. Fast growing drought adapted tree to 18′ tall and 8′ wide in 10 years. Full, all day sun in a hot position in poor to average very well drained soil. Little summer water once established. Forms a very nice trunk in time. Plant with drought adapted shrubs/perennials. Wonderful small garden tree where you need height but don’t want shade. High deer resistance. Slightly tender when very young- fully hardy as an adult (3-4 years). Spectacular in bloom. No shade, it casts no shade.